Ready for a Vacation you won't forget? Chincoteague Island has been voted "Best Small Beach Town" & "Happiest Seaside Town." We call it pure paradise! Seaside Vacations has so many beautiful Vacation Homes on the Island - whether you're looking for a Waterfront Dream Home or a Quaint Cottage, we have the perfect Home Base for your adventures. Located on the Eastern Shore of Virginia, Chincoteague is your escape from the large beach resorts. Experience Chincoteague Island and live like a Local in a Home rather than a Hotel. Enjoy walking to restaurants, shopping, or just spend the day on your private boat dock. We even have pet friendly rentals so you can bring everyone, including your pet. Seaside Vacations provides quality properties that will give you and your family a great stay during your Chincoteague Island Vacation. While you are here, you can enjoy Historic Downtown, take a Boat Tour, frolic on the Beach at Assateague National Seashore, and visit our Famous Wild Ponies at the Chincoteague Wildlife Refuge. Spend the day fishing in Chincoteague Bay or visiting our quaint Shops downtown. There is so much to do, you won't know where to begin! Call us today to book a vacation property for your family, a long weekend getaway, or a family reunion. Whatever your needs in a rental property may be, Seaside Vacations is here to assist you. Blue Heron - A Wondrous Vacation Experience on the ESVA! Captain Freeland - Wonderfully Wonderfront & just waiting for YOU! Sunrise Serenade - Let the Wind & the Waves Sooth your Soul. Wind Rose on Chincoteague Island....because Life is all about the Journey. 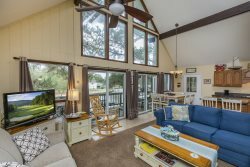 The C-Ray Cottage - An Inspiring Vacation Experience steeped in Chincoteague History! Sunset Pointe: An Unforgettable Bayfront Experience on Chincoteague Island!